Welcome to Day #11 of Chocolate, Enchanted Islands and Pirates Theme Week. 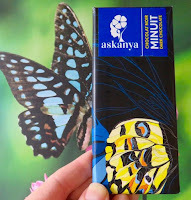 Today we continue with another bar from Haiti: the Minuit* 60% Cacao bar from Les Chocolateries Askanya (Ouanaminthe, Nord-Est, Haiti). 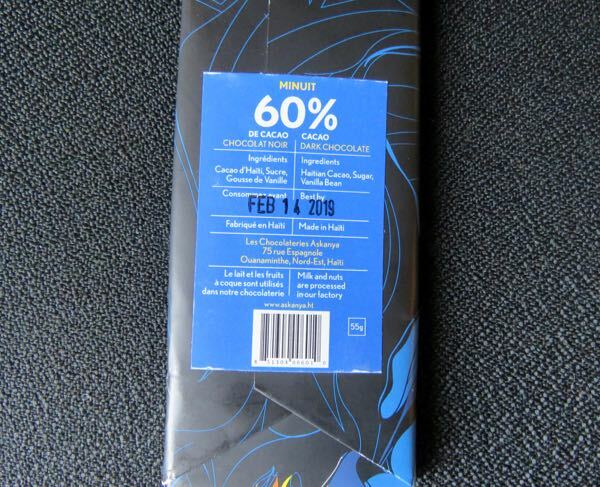 This bean-to-bar chocolate contained three ingredients: Haitian cacao, sugar and vanilla bean. 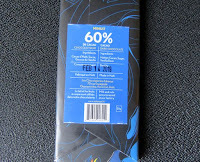 For a 60% cacao dark bar, it was remarkably sweet, to the point where the sweet eclipsed any subtle floral or other flavor notes that might have been in the cacao. Thankfully the richer chocolate flavor and dried fruit and fleeting citrus notes remained. It is wonderful, and rare, to find and be able to enjoy chocolate made in same country where the cacao beans were grown. Making bean to bar chocolate "in country," in a tropical island nation like Haiti can be difficult. Chocolate is best made and stored in a cooler, drier place away from island sunshine. A moment of hot sun on a loading dock can be disastrous for chocolate bars on their way to customers, in any country. Cacao growing countries with a lack of end-to-end climate and humidity controlled/air conditioned processing, storage and delivery infrastructure, with longer shipping routes to customers, face major challenges. All the more impressive then that these Askanya bars this week were largely free of white blotches or "bloom" (usually areas where heat caused cocoa butter and cocoa solids to separate) and/or scuffs. *Minuit means "midnight" in French. Minuit is also the last name of a Dutch colonist, Peter Minuit, who bought the island of Manhattan (present day New York City) from the Native Americans for traded goods with an estimated value of about $24.00 USD) in 1626. Pirate or shrewd businessman? You be the judge. Minuit has also come to mean a colonist, or person who moves to a new country.